First Voice Manager is the most comprehensive yet affordable AED Program management compliance and tracking system available on the market today. A complete and scalable compliance management system used by key facilities, human resources, education, safety personnel and program administrators*. 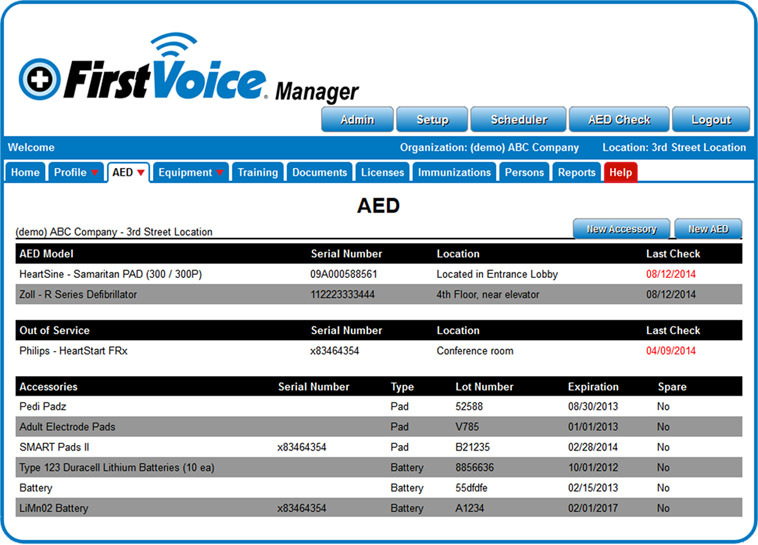 *First Voice Manager was first developed as a basic AED program tracking & compliance solution. Customers responded to the easy-to-use interface and simple design elements which led to requests for the development of additional user features and tracking functionality which address other primary compliance management needs in key operational areas. Do you also need AED Medical Direction, or Medical Oversight? Q.) What is the site address? Q.) How do I get my login information? A.) Customers / Distributors must pay Think Safe before any login information in is provided. Before or with payment a User Set Up form must be filled out and provided to First Voice Manager technical staff which establishes hierarchy reporting and Account Set Up for your company. To email someone in technical support for a copy of this form CLICK HERE or CLICK HERE for a free trial demo of the software. Q.) How much does this program cost per AED? A.) We don't necessarily price per AED but rather we price per customer or per location. Think Safe finds it ridiculous that clients would have to pay per AED as this seems to penalize organizations for placing more AEDs; our philosophy is that we will price per customer to eliminate over-paying for AED program management readiness tracking and reporting. As a side note, there are some clients (trainers) who just want to use the program for keeping track of training certification expiration dates and not AED information. Our online solution is even affordable enough to accommodate pricing for these clients! We are the most affordable provider of this type of 24/7/365 online accessible auto-reminder and tracking solution. Call us for pricing and we'll prove we stand behind this statement. Q.) What can I manage with this program? A.) You can manage your Defibrillators: ACLS models or AEDs, Defib/AED consumable expiry dates, Hazards & Recall Notes, Warranty Notes, First Aid Kit Placements & expiry dates, Any emergency or safety equipment & expiry dates, Program Coordinator Contact Info & Annual Review Reminders, Medical Director Contact Info & Annual Review Reminders and various certified training (First Aid, CPR, AED, BBP, OTHER, ETC.) expiry dates. Think Safe will even load up "other equipment" for you into the system if they are missing an item and you need to database it and track any expiration dates or calibration dates for your operational ease! A.) No, this program is an online program or cloud computing program. If you have access to the internet you can connect by going to www.FirstVoiceManager.com. The type of program we provide is commonly called "software as a solution or SAAS" software. Q.) Does it matter what brand of Defibrillator or AED I own? A.) No, you can maintain all brands of AEDs with First Voice + AED Program Manager. We also will track and maintain your training certifications (First Aid, CPR, AED, BBP, ETC.). This program will also track other first aid equipment and supplies that expire as well.Think Safe will even load up "other equipment" for you into the equipment list - allowing you to track any expiration dates or calibration dates for your operational ease! Q.) Can you provide medical direction? A.) Yes, we can provide this for you as well if needed. Q.) Who is Think Safe and First Voice? A.) Think Safe is the manufacturer of First Voice Products. We have over 1,000 products and services available. We are most known for our Patented & Proprietary "talking first aid manual" or First Voice Emergency Instruction Device (EID). It is a talking first aid device that walks the user thru CPR, and major or minor emergency situations - first aid or homeland security. Coming soon in 2012, watch for our OSHA trainer model! Q.) Is my data safe? A.) Yes, we backup up data several times daily and have many redundancies in place to keep your data safe. First Voice + AED Program can act as a backup in case your AED maintenance information is lost or corrupted on your computer. Q.) Do you sell to distributors? A.) Yes, we do have resellers and prefer to sell through dealers/distributors. If you are interested in becoming a reseller contact Think Safe at 319-377-5125 or email us. Our dealers have consistently remarked at how www.firstvoicemanager.com allows easy and reliable servicing of their clients yet fully functional transparency and even budgeting efficiency for their customer's needs while providing complete legal protection (no dead batteries or expired items). Q.) How will I know when something expires? A.) You will receive an email 30, 60 and 90 days prior to expiration. Plus, you can pull reports of expiration items. From auto-email reminders to full reporting, you will have total budgeting and non-compliance control and transparency over your program; no matter how large your company is! Q.) Can I manage my monthly AED checks with First Voice + AED Program Manager? A.) Yes, every time you complete your online AED Monthly Check Form within www.firstvoicemanager.com it will provide you a copy of the check. The program will also send you reminders to complete your readiness check, if it was not done after 31 days. These readiness alerts are set up on hierarchy reporting so that after 3 days of non-compliance the next level of review or accountability at your company will receive notice on day 4 and finally, your selected level 3 recipient will receive an auto-reminder and non-compliance notice on day 5. This type of reporting and notification is extremely effective for large organizations and small organizations alike. Q.) Do you provide a printable monthly checklist so I don't have to carry the AED to the computer. A.) Yes, There is a link in the help section that will allow you to print. Q.) Do I have to be an advance computer user to use this program? A.) No, anyone can use this program with little or no help. If you are used to the Windows operating system, you will easily be able to use the program. Q.) Can I run reports? A.) Yes, the program has a Reports section, allowing you to run many types of reports.All you need to do is select the report you want and it will email you the information. Q.) Can I import data to make data entry easier for client setup? A.) Yes, contact Think Safe for a copy of the template and further instructions. Q.) If I am an End User in charge of an AED program and I am also a Certified Instructor for my company can you track my Certification date for instructor certificate renewal? A.) Yes, in the Program Coordinator tab there are fields to keep track of your location's in-house training personnel and their respective certification renewal dates. Q.) How many people can access be granted to? A.) There are no limits to the number of people who can access the information and User Login Info is provided based upon the approved Program Coordinator of your company. Users can be given View Only User (1 location for an org), Edit User (1 location for an org), Edit Corp (all locations for 1 org) or Admin (dealers/trainers/distributors with many organizations using www.firstvoicemanager.com). Q.) Do you sell customer information or contact my customers? A.) No, the First Voice software license / terms and conditions agreement which is provided to every end user Program Coordinator very clearly outlines the protection we provide dealers and customers. Q.) Do you offer private label or white label services to larger dealers or distributors? A.) Yes, for a quote or more information please email us or call 319-377-5125. Q.) Does the program allow for keeping track of spare consumables such as extra electrodes or extra batteries I have in stock? A.) Yes, the AED tab has fields to accommodate unlimited spare consumables. Complete this form below if you have any questions.